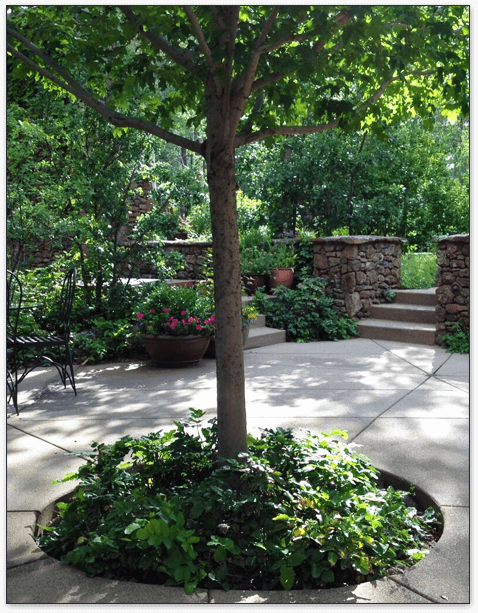 Flagstaff Native Plant and Seed has offered a full range of commercial and residential landscaping services since 1994 — design, construction, planting, and maintenance. We work closely with you to create a custom landscape that is not only an aesthetically pleasing and comfortable space but also water conscious. Our designs incorporate the sustainable permaculture practices of planting native and drought tolerant plants, harvesting rainwater within the landscape, installing permeable paving such as pavers or flagstone, and using local landscape materials whenever possible. We design/build retaining walls, paver and flagstone patios, paver driveways, rainwater collection and irrigation systems, above and below ground water storage, retention basins, outdoor lighting, water features, fireplaces, raised bed gardens, and ramadas. We cloth these constructions with plants purchased from trusted growers who have been supplying us for years. Sarah Michelon has been designing landscapes and managing our crews for the last fourteen years. Please see the Landscape Portfolio. The success of a landscape design is a two part process. Sarah’s conceptual design is of little value without skilled and creative craftsmen to construct it. Flagstaff Native Plant and Seed’s foremen and most of the crew members have been with the company for over ten years. Their efficiency and creativity have become well developed and respected. Maintenance contracts are available for one time, weekly, monthly or seasonal services. Irrigation design, installation, repair, revision, winterization, and spring turn on/inspection services are offered. We maintain an automatic winterization/spring turn on customer list to care for your system when seasons change. We also design/build rainwater irrigation systems. Snow plowing, shoveling, blowing and removal services are offered. We can take requests for these services on call but contracted clients receive priority.